I began a new nutrtion program last week and I was really nervous because the plan I was using was working so well for me historically but after seeing that it not only helped people lose weight happily and was based off a lifestyle and a few principals I decided to give it a try! To my surprise I lost 3 lbs in 3 days even while fully participating in Cinco de mayo party I threw at my house! One of her suggestions was to not have carbs at dinner, I truly thought this would be a NO GO for me, I mean I LOVE carbs and specifically saved them for dinner. She explained that you should use your carbs for energy though the day. Think about it... what do you do after dinner, watch tv, get the kids to bed, wind down? YEP doesn't require much energy right. My favorite part of this program is the accessories! All the yummy things you get to put on your food to make it taste amazing. That is where I was won over. not to mention it is totally working! 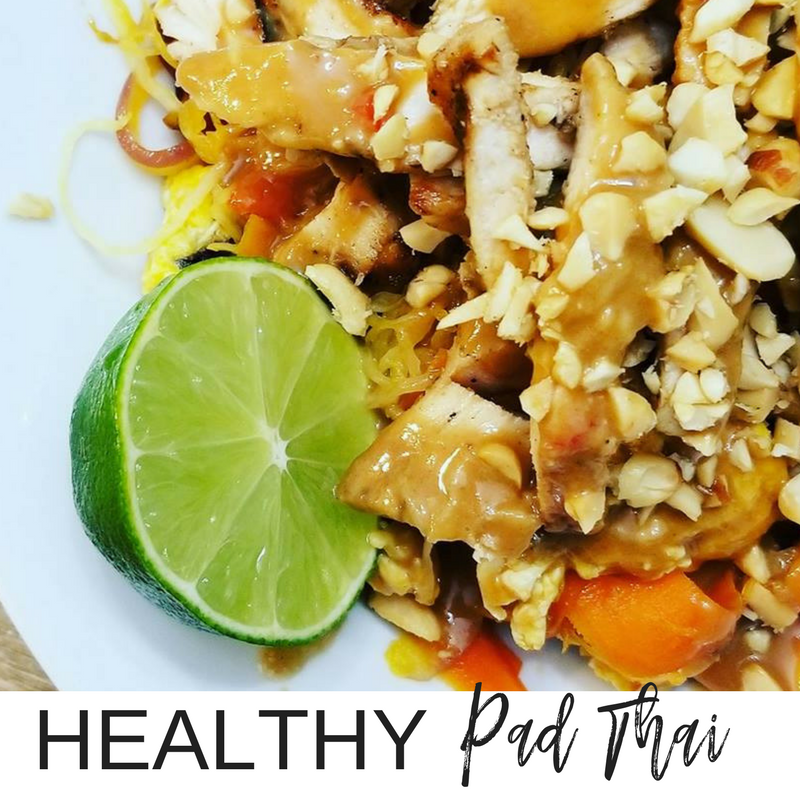 This healthy Pad Thai is not made with noodles, I used spaghetti squash. I HATE when people tell me " It tastes like pasta, you won't know the difference" wanna bet! Pasta is pasta and nothing is like it. 4. While the chicken is cooking and the squash is cooling, warm a saute pan on medium heat add 2 tsp of olive oil to the pan cooking the veggies for about 3-4 min then add in garlic powder, onion powder 2 tablespoons of the soy sauce allow to cook another 3 minutes. 5. Push the veggies to the side, use the extra space in the pan to scramble the 2 eggs. As the eggs cook open the squash and scrape the seed out of the middle scraping the squash noodles into the pan, stir to incorporate it all. Test seasoning and adjust as needed. 6. Add veggie mixture to a bowl, top with chicken, peanut sauce as desired and chopped peanuts. Serve with a lime to squeeze over before eating! I hope you enjoy this dish as much as I did!